Summary: This is the fourth in this series about the new politics now emerging in America, in some ways different than anything in our long history. 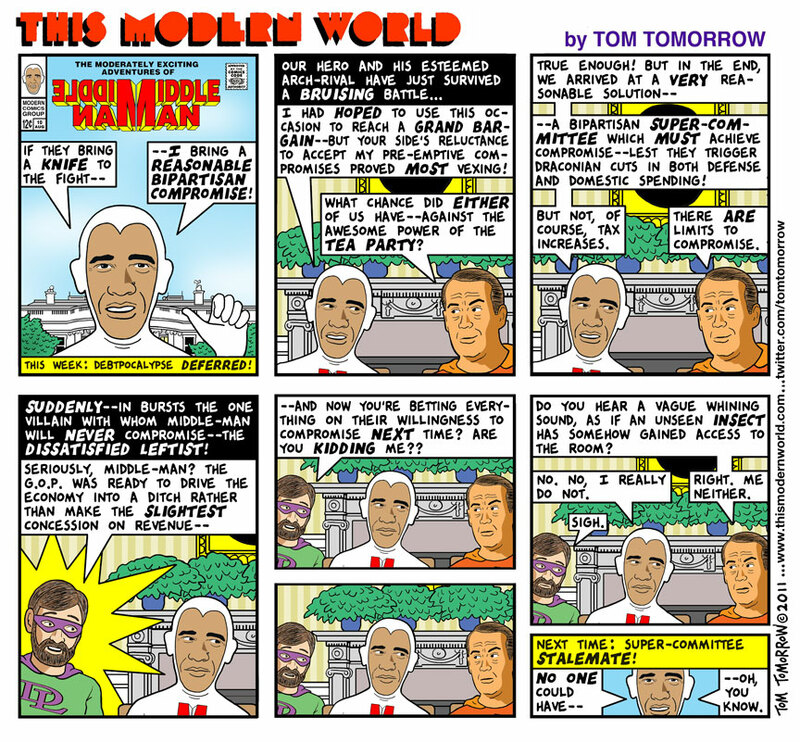 Here we look at the new GOP and its shock troops, the Tea Party Movement. When reading the many articles describing it as crazy, ignorant, and doomed — remember that they are the dominant force today, dragging the political spectrum to the Right (due to the length of this post, supporting material about this is in the comments). Our government’s structure is exceptional because it is flawed, and so copied by few other nations. Part two discussed this. The first is the dynamite, the second the detonator. But the problem was inevitable, and would eventually have emerged, during this crisis or some future crisis. The Founders hated and feared “factions”, but made few provisions in the political system for their management. Today we discuss the second factor. The US political system has matured into ideologically coherent parties, with both having an extreme that provides shock troops. It’s the logical evolution of our system, remarkable only in that it took two centuries. The Republicans, as usual, do this much better than the Democrats. Elements in the GOP coalition have built the Tea Party movement into a powerful grassroots activist network. Surprisingly, with its powerful backers the Tea Party Movement has come to dominate the GOP, yet another of the historically commonplace instances of a tribe emerging from the margins to dominate the group. Here are some articles that describe this new force, and how it fits into the politics of the New America now under construction. 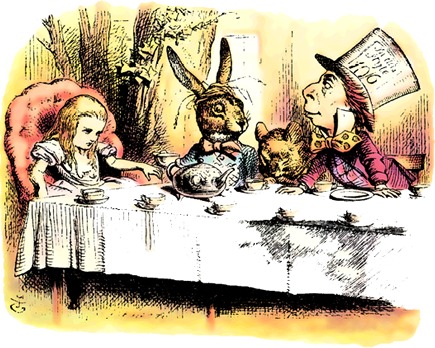 It looks like this kind of tea party, but isn’t. (a) … the Newest Right can be thought of as being simply a group of “extremists” who happen to be further on the same political spectrum on which leftists, liberals, centrists and moderate conservatives find their places. But reducing politics to points on a single line is more confusing than enlightening. Most political movements result from the intersection of several axes — ideology, class, occupation, religion, ethnicity and region — of which abstract ideology is seldom the most important. (b) … the Newest Right or Tea Party Right is populist. The data, however, show that Tea Party activists and leaders on average are more affluent than the average American. (c) … the Newest Right is irrational. The American center-left, whose white social base is among highly-educated, credentialed individuals like professors and professionals, repeatedly has committed political suicide by assuming that anyone who disagrees with its views is an ignorant “Neanderthal.” Progressive snobs to the contrary, the leaders of the Newest Right, including Harvard-educated Ted Cruz, like the leaders of any successful political movement, tend to be highly educated and well-off. The self-described members of the Tea Party tend to be more affluent and educated than the general public. While less than one in five (19.4%) minority non-Southerners and about 36% of Anglo non-Southerners report supporting the movement, almost half of white Southerners (47.1%) express support…. In fact, the role that antigovernment sentiment in the South plays in Tea Party movement support is the strongest in our analysis. Even though, like the Jacksonians and Confederates of the nineteenth century, they have allies in places like Wisconsin and Massachusetts, the dominant members of the Newest Right are white Southern local notables — the Big Mules, as the Southern populist Big Jim Folsom once described the lords of the local car dealership, country club and chamber of commerce. These are not the super-rich of Silicon Valley or Wall Street (although they have Wall Street allies). The Koch dynasty rooted in Texas notwithstanding, those who make up the backbone of the Newest Right are more likely to be millionaires than billionaires, more likely to run low-wage construction or auto supply businesses than multinational corporations. They are second-tier people on a national level but first-tier people in their states and counties and cities. … The political strategy of the Newest Right, then, is simply a new strategy for the very old, chiefly-Southern Jefferson-Jackson right. It is a perfectly rational strategy, given its goal: maximizing the political power and wealth of white local notables who find themselves living in states, and eventually a nation, with present or potential nonwhite majorities. It is perfectly rational for the white local notables of the South and their allies in other regions to oppose universal, federal social programs, if they expect to lose control of the federal government to a new, largely-nonwhite national electoral majority. Turning over federal programs to the states allows Southern states controlled by local conservative elites to make those programs less generous — thereby attracting investment to their states by national and global corporations seeking low wages. … Today the white notables of the South increasingly live in states like Texas, which already have nonwhite majorities. They fear that Obama’s election, like Lincoln’s, foreshadows the emergence of a new national majority coalition that excludes them and will act against their interest. Having been reduced to the status of members of a minority race, they fear they will next lose their status as members of the dominant local class. 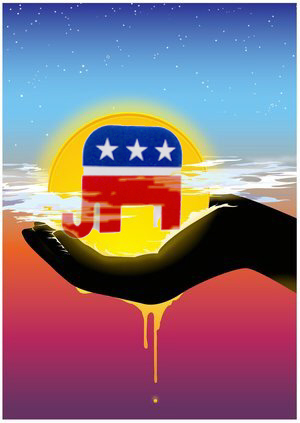 While each of the Newest Right’s proposals and policies might be defended by libertarians or conservatives on other grounds, the package as a whole — from privatizing Social Security and Medicare to disenfranchising likely Democratic voters to opposing voting rights and citizenship for illegal immigrants to chopping federal programs into 50 state programs that can be controlled by right-wing state legislatures — represents a coherent and rational strategy for maximizing the relative power of provincial white elites at a time when their numbers are in decline and history has turned against them. They are not ignoramuses, any more than Jacksonian, Confederate and Dixiecrat elites were idiots. They know what they want and they have a plan to get it—which may be more than can be said for their opponents. 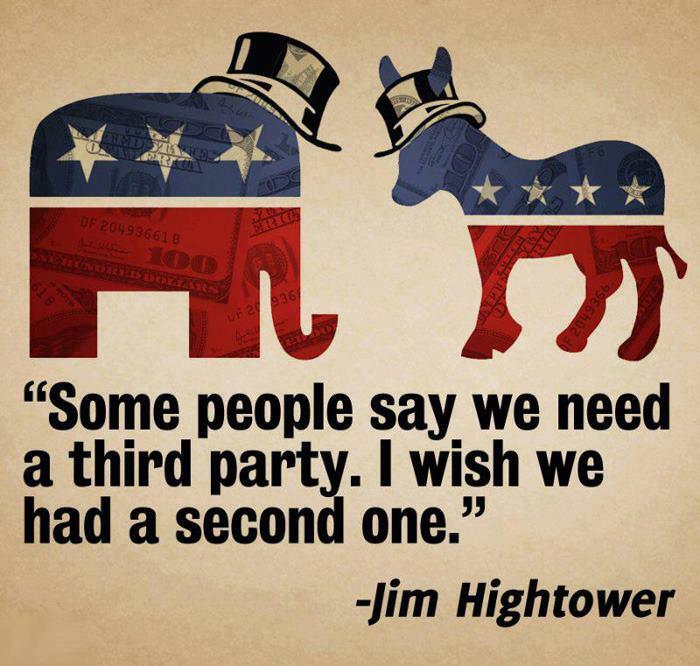 The parties – both of them — are strong in the sense that almost everything in US politics runs through the parties. That hasn’t always been the case. In the nadir of party strength, which was roughly in the postwar era, much of what happened in US politics didn’t run through the parties at all. … Now most campaign professionals and a large number of governing professionals are party people — not (usually) from formal party organizations, but people who have made their careers working within one political party, usually for a series of candidates and party-aligned groups. The party-aligned press is strong, especially on the Republican side. Candidates raise most of their money from party donors, often through party-aligned groups of one kind or another. Because (or at least probably because) most of this party growth has taken the form of informal networks of party loyalists rather than under the control of formal party organizations, it’s meant that our contemporary strong parties are not inherently hierarchical. The Tea Party is a powerful force in the GOP, acting as shock troops. But shock troops lead the way into battle; they are not the leaders. Political leaders often work behind the scenes, especially when arranging unpopular but potentially effective actions. If you want to understand the government shutdown and crisis in Washington, you need to get inside the base of the Republican Party. That is what we are doing in the Republican Party Project and these focus groups with Evangelicals, Tea Party, and moderate Republicans. All the passion, nuances and divisions found expression when we conducted this work in the summer. Understand that the base thinks they are losing politically and losing control of the country – and their starting reaction is “worried,” “discouraged,” “scared,” and “concerned” about the direction of the country – and a little powerless to change course. They think Obama has imposed his agenda, while Republicans in DC let him get away with it. Talk of political polarization often masks the agreement of the two parties on many key issues, such as domestic surveillance, our foreign wars, government support of banks (in good times and bad), and many aspects of macroeconomic policy. Previous Post About the crisis: The GOP is right. So is Obama. That’s why it’s a crisis. FM is always beautifully written. But I know FM usually supports William Lind’s viewpoint. Mr. Lind is close to being a Tea Party supporter, except he likes streetcars over autos. He worked for Free Congress, which was founded by the guy who founded the Heritage Foundation. How do you explain FM’s contradiction? I do not see the contradiction. To agree with someones’s view of one issue does not imply agreement with everything that person believes. If so, agreement with the Founders about creating America would imply endorsement of slavery. Also, there’s the non-vote on the Syria non-a-war. It was the left and the Tea Party that stopped that. The Obama, Feinstein, McCain the ‘moderates’ and the mainstream media were all ready to starting killing some Arab people. That is an interesting example of the extremes vs the big center. Many in some conservative circles oppose our wars. Patrick Buchanan and many writing at American Conservative, part of the long conservative opposition to foreign adventures. But with this is the reflexive partisan opposition of the outs to any initiative to those in power. Many liberals denounced Bush Jr as Hitler for doing things that they applaud Obama for doing. Similarly I wonder how many in the TP movement oppose Obama’s Syria policy because he is a democrat, atheist, Moslem, socialist — but would applaud a patriotic bold defender of American (I.e. A GOP president) for doing so. More significant than Buchanan is Ron Paul and his followers opposing the wars. Ron Paul and Occupy Wall Street might agree on a few things beyond foreign military intervention — more examples of the extremes against the center. Great point. Thanks for mentioning that! So the tea party is making a calculated anti-war move rather than being of pure heart? Oh dear, oh dear. A large factor of this was the polls. . There was massive opposition to this, and the calls into congressmen came in hugely against the Syria war. The progressives and Ron Paul and his supporters were against the wars to start with — and the Tea Party had the sense to know which way the wind was blowing. This Syria not-a-war came in just after the NSA news and that multi-embassy evacuation. I think this all fed into a very justifiable sense of cynicism about the security establishment. I suspect the moderates were expecting scary scary stories on the TV news to sway the public in favor of the Syria attack, and they were all left hanging in the end. They just couldn’t sell the war because no one believes a word they say. I have not seen anything on which to say *why* some elements of the Tea Party opposed intervention in a Syria. “Why” is often the most difficult of questions to answer. My guess (emphasis on guess) is that most of those who opposed the war — breaking with most of their fellow conservatives — did so sincerely, like Pat Buchanan and Ron Paul. This post was too long, so I cut this note. But it’s an important insight for both US domestic affairs and our foreign policy. This is an essential article to read about our mad Long War: “Terror: The Hidden Source“, Malise Ruthven, New York Review of Books, 24 October 2013 — Review of The Thistle and the Drone: How America’s War on Terror Became a Global War on Tribal Islam by Akbar Ahmed. This excerpt applies to the Tea Party as well as the Taliban. Rather than exploiting the denizens of “remote tribal regions” as Obama’s speech proclaimed, the terrorist activities associated with al-Qaeda and its affiliates are actively engaging the responses of tribal peoples (the thistles of Tolstoy’s metaphor) whose cultures are facing destruction from the forces of modern society — including national governments — currently led by the United States. In this, as in numerous other settings, Ahmed puts his finger on the crucial linkage connecting the localisms of tribal conflicts with the broader Islamic notion of global jihad. His theme is not some vaguely defined “clash of civilizations” but rather the clash between metropolitan centers and rural peripheries that is internal to all modern civilizations—whether these be Islamic, Western, Russian, or Chinese. He provides numerous examples to show that the “thistles” of Tolstoy’s metaphor are to be found in a wide variety of regions, including Somalia, Yemen, Afghanistan, Kashmir, and Pakistan’s northwest frontier, as well as Berber North Africa, Nigeria, and Aceh in Indonesia. every aspect of life — religious… and political leadership, customs, and codes — is in danger of being turned upside down. The particles that formed the kaleidoscope of history and remained stationary for so long have now been shaken about in bewildering patterns, with no telling when and how they will settle into some recognizable forms. Why do I believe the Right is winning? Let’s look at some articles of the past few days, much like the news flow for the past few years. “Conservative Georgia District Urges G.O.P. to Keep Up the Fight“, New York Times, 6 October 2013 — Read the quotes! “Take Back the House? Democrats Aren’t Even Ahead on Friendly Turf In 2014“, Nate Cohn, The New Republic, 7 October 2013 — Candidate selection is vital, and the GOP has the enthusiastic edge. “The mythical moderates?“, David Karol (Assoc Prof of Politics, U MD; bio here), blog of the Washington Post, 8 October 2013 — The GOP has stronger internal cohesion, giving them an edge in every conflict. “The conservative shift in public opinion has happened in all 50 states“, Peter Enns (Asst Prof Government, Cornell; bio here), blog of the Washington Post, 8 October 2013 — This is the pure form of political change. I think Dems are weak because they are so beholden to donors. Donors are right wing oriented when it comes to finance. America is in a self destructive pattern. It will be I think in a different place when it realizes the wrong road it followed. I do not think regenerating from there will take America to a much better place as the capacity just won’t be there since America’s education system is suffering. Most important resource is human capital. In last comment on FM’s previous post i gave both sides motives. But what are the motives of those that are leading the Tea Party? What are the motives of the ultra wealthy that are financing teaprtiers? As i have felt and experienced before, this kind of chaos (and worse ones) provide perfect cover for crimes of the century. Usually such fraud and crime like getting billions from failed banks and corporations need cover and not to be investigated and prosecuted. They have enough money and power to instigate such chaos. If there is a bigger chaos then there will be even bigger oportunity to con people out of money. In Balkan wars, in the middle of the chaos, state of Croatia and Slovenia printed new currency while old Yugoslav Dinar was transfered to the remainder of Yugoslavia, exchanged for foreign currency then split between warring presidents Tudjman and Milošević. Jihadis are also played footsie with. It appears the dance with sometime enemeies is a continuing tradition from mafia to drug cartels to Jihadis. The recent Libyan catch was a asset, let go by US and given asylum by British! CIA used mafia to try to kill Castro. Mafia was interested as Castro had shut down their gambling casinos. Then there is drug cartel connection. its been publicized in different material. Latest is a book by Mexican journalist. I have also been recommended to read the Underground Empire. Including extremists given asylum by British against native country government’s desires-like the recent Libyan catch! “Sudan was under pressure from Moammar Gaddafi, then Libya’s president, to stop harbouring Libyan al-Qaeda operatives who wanted him overthrown and replaced with an Islamist regime. “In his memoir The Black Banners, Mr. Soufan said that John O’Neill, then the head of the FBI’s bin Laden unit, warned British detectives that they were making a serious mistake by letting him go. When his house in the city was finally raided by police, they discovered a 180-page al-Qaeda manual on methods of carrying out terror attacks and assassinations. “In 1995, al-Liby was granted political asylum in the United Kingdom, after a failed Al Qaeda plot to assassinate Hosni Mubarak, then president of Egypt. An Egyptian request for extradition was declined on the grounds that al-Liby would not receive a fair trial. “in a 2011 book, FBI agent Ali Soufan claimed that al-Liby actually was arrested . Associated Press on 9/21/2001 reported that the raid may have been conducted as part of an investigation into al-Liby’s role in the 1998 embassy bombings. Al-Liby is arrested and then let go for lack of evidence. I appreciate these threads as a means to “see” and “understand” the world. As I’ve tried to better understand US history, patterns of revolution and counter-revolution seem to be the norm until a national crisis emerges to temper the grievances temporarily. In my mind, the interesting part is if/when one group militarizes and how they train, equip, and fund the political violence. More so, are they capable of achieving their aims? It’s the first time the Oath Keepers, part of the antigovernment “Patriot” movement, has moved in the direction of actually establishing any sort of militia or fighting force of its own. While the group’s rallies are sure to bring a fair share of wild conspiracy theories and weapons, Oath founder Stewart Rhodes has heretofore dismissed criticisms of the group by saying the fears that are central to the group’s very identity – all centered around the idea that some sort of tyrannical “New World Order” is looming – are merely hypothetical worries. With the formation of these units, it seems, Rhodes and his 30,000-plus Oath Keepers have dumped the theoretical in favor of practical preparation for some post-apocalyptic world when the fabric of American civilization begins to fray. The effort also seems to represent a more radical turn for the group. But that pales in comparison to what Rhodes has now endorsed. “We will … be force multipliers to help prepare communities so they can preserve civilization by providing their own security, disaster relief, infrastructure preservation, emergency communications, strategic food reserve, and medical care,” the article continued. Thanks for alerting us to this! I read Salon, but missed this. It’s is a logical development for the Oath-keepers. Much like the evolution of the Freikorps in Germany after WW1 (see Wikipedia). That didn’t end well. These guys are not looking to do FEMA’s work, they look like private users of force — attempting to do the work of law enforcement and the National Guard. Or the KKK (keeping White’s property and women safe from the Black mobs). I wrote about this: About the Oath Keepers: boon or bane for the Republic?, 12 June 2010. It’s time to revisit the subject. As a radical, insurgent yet also reactionary grassroots movement nevertheless with high income ties, today’s Tea Party bears striking semblance to the French Catholic League, a 16th century French organization headed by the Dukes of Guise and financed by Philip II of Spain. To draw the analogy further, Obama would be a Politique, the faction that believed France’s national interest trumped various sectarian concerns. Richelieu would epitomize this faction in the next century. As for me, in this context, I would be a Huguenot. I of course, am not very interesting; but this is my disclosure. I will develop this concept in subsequent comments, probably in response to other posts – as this one is already getting a bit dated. Stay tuned. I look forward to hearing more about this. Just this note is original and brilliant! Putting our current events in a historical context makes them far easier to understand, IMO. Interesting concept. Who would be the today’s Henry of Navarra? A leader that gives up some of his core believes in order to be acceptable for his enemies and as a result destroys their supporter base? The hard reality is that American middle class wages are going to fall in the future–a lot. There is no way to justify American engineers/nurses/etc making 5x what their Chinese/India counterparts make, or 2x what their European counterparts make. The way forwards is to redesign our society so that the drop in wages doesn’t hit true living standards. We are wasting huge amounts of money on such things as unnecessary commuting due to suburbia, to speak nothing of the military/healthcare/edumacation/prison/legal/financial and other industrial complexes. Cutting waste allows for cutting real wages without cutting living standards. The bad news is that the competition can also cut their waste and thus their wages, so we’d be back where we started. The good news is that our competitors have even more dysfunctional politics than our own, and are thus unlikely to cut their waste anytime soon. What gives energy to the Tea Party is the failure of Democrats to push for lower costs as the remedy for the lower wages which have already arrived for many Americans and will be arriving soon for everyone else. Affordable Care Act is typical. Doesn’t really address the basic problem, which is that healthcare is too damned expensive. What is needed is to bust the doctor’s and nurse’s unions, bust the regulations that prohibit widespread use of computer-based-diagnosis and other productivity enhancements, force hospitals to agree to a flat fee before any discretionary surgery so that patients can truly shop around, allow true catastrophe insurance, scrap bankruptcy exemptions and thus incentivize people to avoid high healthcare costs, get the government out of the healthcare industry other than for essential emergency care, etc. The Democrats have been branded, correctly, as the party of tax-and-spend. That is NOT a good label, whether or not the Republicans are the party of borrow-and-spend-on-cronies.